It may not be a well-known fact; however, more Americans are exercising than ever before! Many of us exercise but still can’t seem to get to that body we’ve always wanted. It’s easy to feel overwhelmed about staying healthy and fit when there are so many people and businesses telling us that their way is the only way. How often have we heard that we shouldn’t eat something but someone else says we should eat it, or down the road science finds out that it’s actually not as bad for us as we thought, in fact, it’s really good for us! Well, if you’ve ever felt frustrated by any of this, we want to give you a few very simple do’s and don’ts that can make a big difference in how healthy you feel from day today! Water! We’ve all heard about it, our friends, family or co-workers are always telling us we need to drink more water! Well, it’s true. You do! The problem is, we all think we drink “enough” water. But the truth is, 75% of Americans are dehydrated to some level, falling short of the recommended 10 glasses per day. It would surprise you to learn just how many of your day to day ailments are caused by not drinking enough water! If that’s not enough to convince you, here’s a quick list of what being sufficiently hydrated can do for your mind and body. Alcohol! 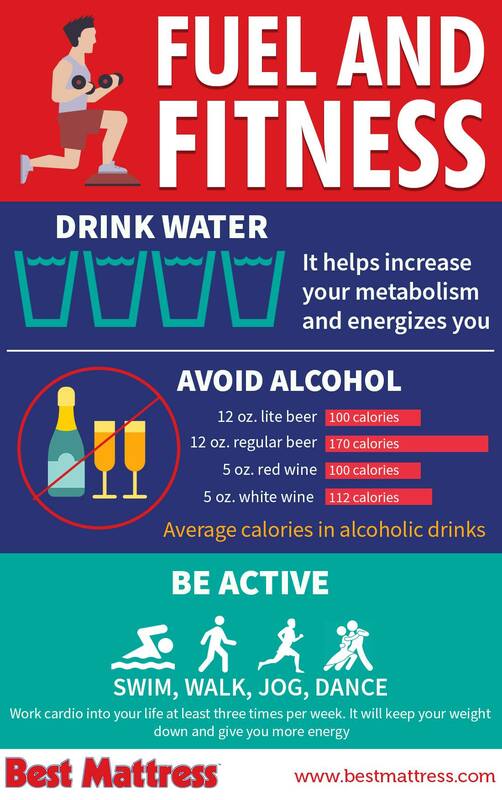 There’s a rule of thumb that many fitness gurus go by and that’s, “don’t drink your calories!” If you can avoid drinks that contain calories, it is far easier to stay under your daily calorie recommendations. For some of us, sticking to water and 0 calorie drinks is asking for too much. When it comes to alcohol, however, avoiding moderate to heavy alcohol consumption will make a huge difference in your overall well being. Even alcohol that is advertised as a low-calorie beverage is deceptively unhealthy for our body. Health experts say that if you do choose to consume alcohol, limit your intake to 1 drink per day for women and 2 per day for men. Get Moving! Be active every day! A minimum of 1 hour a day is a great start. You don’t have to start training for a marathon, but you do need to get moving. Go for a half hour walk in the morning and evening. If you can, mix up your activities throughout the week; run, walk, jog, hike, bike or swim! 3 days a week, however, try to add intensity to your exercise of choice. Push yourself just a little harder and get the heart pumping for at least half an hour. Even if you don’t see the weight dropping off, you will be and feel healthier! Sleep! Now, we are one of the best sellers of better sleep in the Las Vegas area so we would be remiss if we didn’t advocate for a better nights sleep as well! Do not underestimate the power of a getting not just 8 hours of sleep, but 8 hours of great sleep! Our sleep experts have helped tens of thousands of people get a better nights sleep, and we absolutely love it when our customers, friends, family, and neighbors come back into the store to tell us what a difference we made in improving their lives, and we would love to help you too!